Our user base of 9-12 year olds is our least engaged audience on Epic! and we’re not sure why. Comic books make up a large percentage of what 9-12 year olds read on our platform, therefore it is very impactful experience for those users. We know the current reading experience is not ideal. Qualitative and observational research in classrooms tells us that users are pinching to zoom into comic book panels to read them one by one. If we create a better comic book reading experience, our book opens on mobile devices will increase overall and users will finish more comic books. Now that we had our goal (and a name) I started work on Comic Zoom. Before sketching, I wanted to research how other comic book eReaders were handling the comic book experience—namely what I thought they were doing well, and what I felt could be improved. My search also included fringe apps for manga readers and younger readers in a similar age range of 9-12. There’s a ton of comic book apps on the app store, but surprisingly not many for kids. 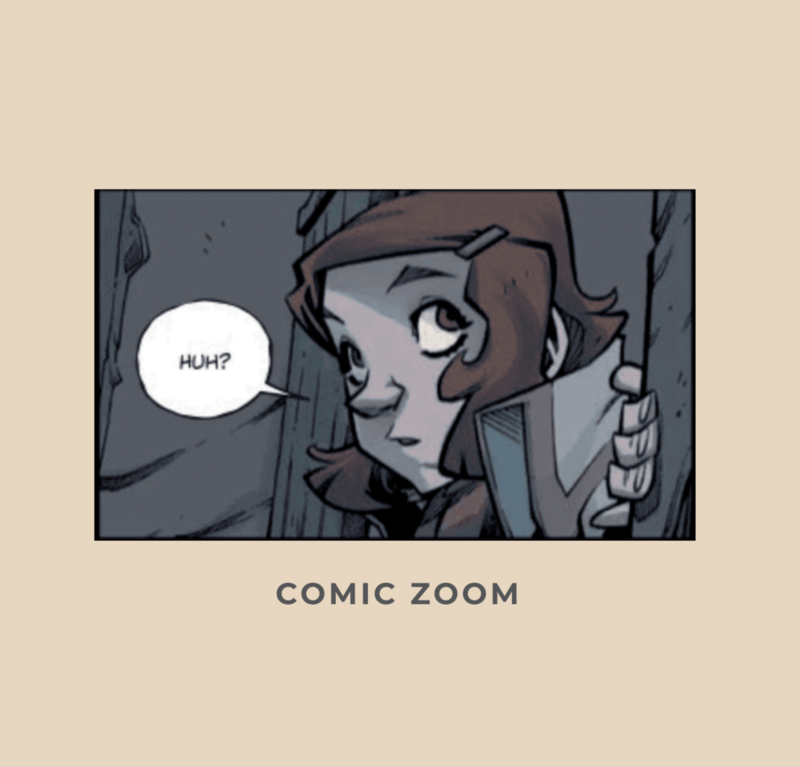 Most apps have “zoom” feature that increases either the size of the speech bubbles to be more legible, or crops comic pages to their individual panels to be read one at a time. Double tap or double click takes the user into the zoom feature on mobile and web respectively. Some apps (not all) have a short tutorial explaining the feature when the user opens a comic book for the first time in the app. Most users are passionately divided 50/50 as to whether or not they prefer using panel zoom or reading in full page. Meet Sarah, our comic zoom user persona. Freddie is based on several interviewees I’ve interviewed in the past. This helps me get into the mindset of our 9-12 users, what they like and how they act so I can better design for the user. Opt in or opt out options? How do you feel about the size of the content? Does double-tapping and entering comic zoom an expected response? Yes or no? Do you prefer reading in full-page or in comic zoom? Observation: Were they entering and exit comic zoom with or without frustration? One kid thought it was tap to go to next panel. It took them a few tries to figure out swipe. One kid was uncomfortable with the panel mode because he did not know what to expect when exiting out. Develop a zooming animation that smoothly transitions from full-page to “comic zoom” view to provide context for the user. More usability testing around auto opt-in to comic zoom and manual opt-in. In hindsight, Comic Zoom is and continues to be a challenging project because of the amount of dev work involved to have a sufficient (realistic) prototype. Sometimes usability tests were invalid because the prototype was not working properly. Next time I would try to find a more robust prototyping tool so that we could do more usability tests well before dev needed to be involved. As such, I think we are close to a good experience, but it could be improved with more usability testing around on boarding the users to comic zoom in the smoothest way possible.